Government agencies need detailed, thorough, accurate, and timely information about their candidates to fulfills local, provincial and national regulations. They require flexible ordering methods to accommodate in-person and distance recruitment. They also need to know that their information is handled perfectly every time – from secure storage, to timeliness, to accuracy. Thorough background checking reduces turnover and hiring costs, improves the quality of hire, and is an important part of satisfying hiring regulations for working within government. A third-party like BackCheck can fulfill each of these requirements, while minimizing costs and providing quick turnaround results. 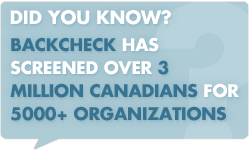 BackCheck is the first choice for government agencies including municipal governments, provincial and territorial governments, police services, and crown corporations. We have the experience to customize solutions and deliver results to you, and a roster of CISD cleared personnel to allow us to serve you right away. With all clients, we take a customized approach to packaging services ensuring we meet each of our clients’ screening needs. Contact BackCheck today to learn more about screening candidates in the government sector.